Around the Gulf Coast, people look forward to firing up their barbecue pits for fresh local fish, shrimp, or chargrilled oysters. Like many, I happen to have a deep love affair with grilled seafood. There’s really nothing quite like it. The char and the smoke pair so well with the natural sweetness of seafood and saltiness of the sea. Last summer, on my very first episode of Food Network Star, we were challenged to create a signature dish for an outdoor party using only a gas grill and an induction burner. I opted for grilled shrimp served over a tasso corn maque choux. The flame-roasted shrimp packed just the right flavor to pair with the smokiness of the tasso, and it helped me win that round. Later in the competition, I grilled whole branzino. While not a native Gulf fish, the European seabass definitely worked perfectly on the grill. All around the Gulf of Mexico people veer toward seafood on their grills. Often forgotten in this landscape is where Mexico itself meets the Gulf. Heading south from Brownsville, Texas, and the Rio Grande Valley, the Mexican coastline along the Gulf of Mexico stretches all the way to the tip of the Yucatan Peninsula. In the midpoint of that long shoreline is the city of Veracruz, which is famous for its culinary blend of Spanish, African, and Caribbean cuisines, as well as that of the indigenous population. Many of the same influences can be found across Louisiana, especially in the Creole population of New Orleans. 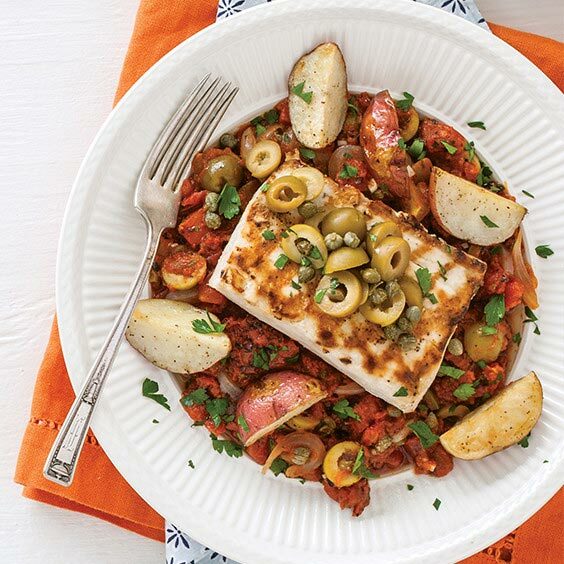 The term “a la Veracruzana” refers to a sauce of tomato, jalapeño, onion, garlic, and olives or capers, which represent a Mediterranean influence. Huachinango a la Veracruzana is a traditional whole red snapper baked in Veracruz-style sauce with potatoes and often served over rice. In honor of that traditional dish, I’ve taken the mahi mahi, a common fish in the Gulf of Mexico and Caribbean, and served it marinated and grilled with a traditional Veracruzana sauce. A little Gulf of Mexico, south of the border. Preheat oven to 400°. Line a rimmed baking sheet with foil. Spray grill rack with nonflammable cooking spray. Preheat grill to medium-high heat (350° to 400°). In a large bowl, toss potatoes with 1 tablespoon oil, ½ teaspoon salt, and ¼ teaspoon pepper; place on prepared pan in an even layer. Bake for 20 minutes. Toss potatoes, and bake until potatoes are browned and tender, 10 to 15 minutes more. Set aside. Meanwhile, in a large baking dish, place mahi mahi; top with lime juice. Turn fillets to season both sides with lime juice. Let stand for 15 minutes. In a large saucepan, heat remaining ¼ cup oil over medium-high heat. Add onion; cook, stirring frequently, until onions begin to brown, about 5 minutes. Add garlic and jalapeño; cook for 1 minute. Add tomatoes, ½ cup olives, 2 tablespoons capers, 1½ tablespoons parsley, oregano, and bay leaves. Cook, stirring frequently, about 5 minutes. Reduce heat to medium-low. Stir in ½ cup water, and simmer for 15 minutes. While sauce simmers, remove fillets from lime juice, and pat dry with paper towels. Sprinkle both sides of fish with remaining ½ teaspoon salt and ¼ teaspoon pepper. Grill fillets until flesh is white and firm, about 4 minutes per side. Using tongs, rotate fish 45 degrees to create cross-hatch grill marks; cook for 1 minute. Turn fillets, and repeat procedure. Remove fish from grill. Ladle sauce into 6 large serving bowls. Place fillets in bowls, and top with remaining . cup olives, remaining 2 tablespoons capers, and remaining 1½ tablespoons parsley. Arrange potatoes around fish, and garnish with lime wedges and parsley, if desired. Serve immediately.